He was found wandering the streets of Lancaster, California. Like thousands, probably millions, of other stray dogs, he was sick and starving. Nothing but bones and matted fur, an infected wound festering on the side of his face, days from death. Anemic, his intestines wriggling with parasitic worms and foxtails (those scrubby plants that grow in parking lots) embedded throughout his body causing infections even in his eyes and lodging in his carotid artery, George teetered between life and death for almost two weeks before finally stabilizing. Posted in Dogs, Heroes, Justice, Rescue. Tags: Dogs, hero, rescue, stray, survivor on May 16, 2016 by mwrogers. 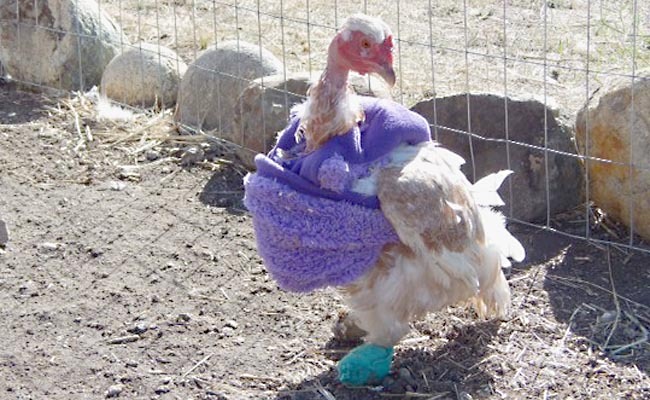 This is Ned the chicken in all her glory with her sweater for warmth. Her home made 'feet' are mismatched; one is teal, the other a light purple. Temperatures had plummeted below normal for several days in a row in winter of 2013. Tracy Reynolds crossed the yard of her Campbell Range acreage on the southeast edge of Kamloops to check on her flock of chickens. She grew more concerned with each step when she noticed a soft bump on the cold, hard ground outside the coop. Posted in Birds, Heroes, Rescue. Tags: Birds, chickens, survival on September 12, 2015 by Michele Young. This injured sparrow found in the street brought back memories of a bird I took care of as a kid. It was a flutter, like a leaf flipping in the breeze, but it was enough to catch my daughter’s friend’s eye. In the middle of St. Paul Street, in mid-afternoon of a September day last week, we found an injured sparrow floundering as cars passed by. I scurried over to the crosswalk and picked her up. It was a grown female sparrow. Her wings seemed okay and she wasn’t bloodied at all, but as I carried her over to a green space beside a nearby building, I realized one of her eyes wasn’t open and her neck seemed floppy. Figuring she was just stunned, I set her in some bushes where I thought she’d be safe and we went on our way. When we headed back home, we stopped by to see how she was doing. As we neared the bushes, we saw a female sparrow take off into the sky. Good, I thought. She bounced back. Then we checked on the ground and found her. She was flopped over on her back, her neck bent in an uncomfortable position. Well, we couldn’t leave her, so she came home with us. I hoped that with a little bit of time and rest, she’d get better. We set her up in a box with a soft cloth. I gave her water from a syringe, which she gulped down despite being obviously scared. Her little body was heaving with frightened breathing. I didn’t think she’d make it through the night. The next day, she was still alive. But her neck and her closed eye weren’t any better. I put some bird seed into the box and gave her more water. When I set her back down, she kept trying to fly. The wings were willing, but she couldn’t get her head up. I sought information on the web and made a couple of calls. I reached an animal-health tech at a local vet clinic. She confirmed what I feared; a bird can break its neck and not die. That seemed to be the case for this poor sparrow. As much as I hated to do it, I carried the box to my car and drove to the clinic. The tech gently took the box and looked inside. The bird was definitely stressed and not doing well by that point. She took the sparrow away to quietly euthanize her. She wasn’t the first injured sparrow I’ve dealt with. But despite all the handling, she hadn’t tried to bite me. I can’t say that for another sparrow I met when I was a kid. My brother and I found him one Christmas Day. Chirpy was flapping around the snowbound yard. His wing was broken and had healed in a way that left him flightless. But he was alive. We caught him and kept him in a cage. He lived for a couple of years, but never did tame up. Chirpy was kept by a window and was happiest, or at least noisiest, when he saw other birds flying by or he was outside in the yard in his cage. As we had two cats, he had to stay in a room with the door closed. Even after two years of living in our house, he never gave in to domesticity. If I put my hand in the wrong place at the wrong time, his pointy beak pecked at me. I’m still not sure if he was better off being kept captive but alive, or free but likely dead in a few days. This female wasn’t pecky like Chirpy was. Probably because she didn’t have the strength in her neck. I felt like I should have made her a tiny little bird neck brace or something so she could have flown off into the sky. Birds are fragile creatures and I don’t know what happened to this one that she was so badly hurt, yet not dead. She tried so hard to fly. 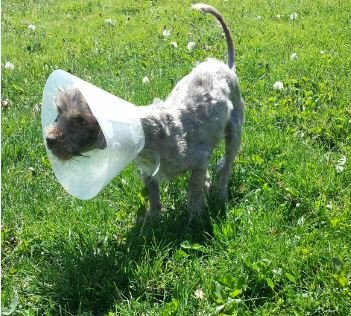 Nothing was going to make her neck better, however, and that’s what finally makes me feel an unsettled peace with having her euthanized. Posted in Birds, Rescue. 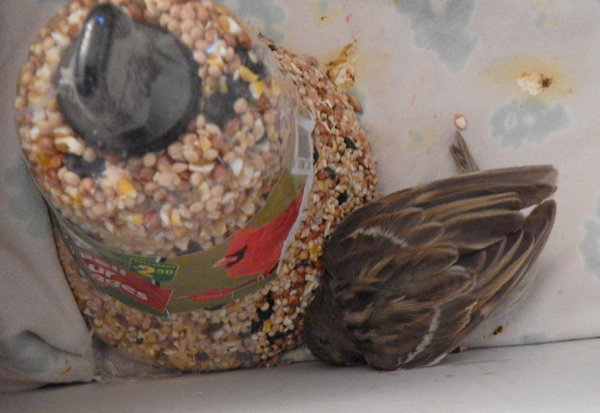 Tags: Birds, injured wildlife, rescue, sparrows on September 9, 2014 by Michele Young. 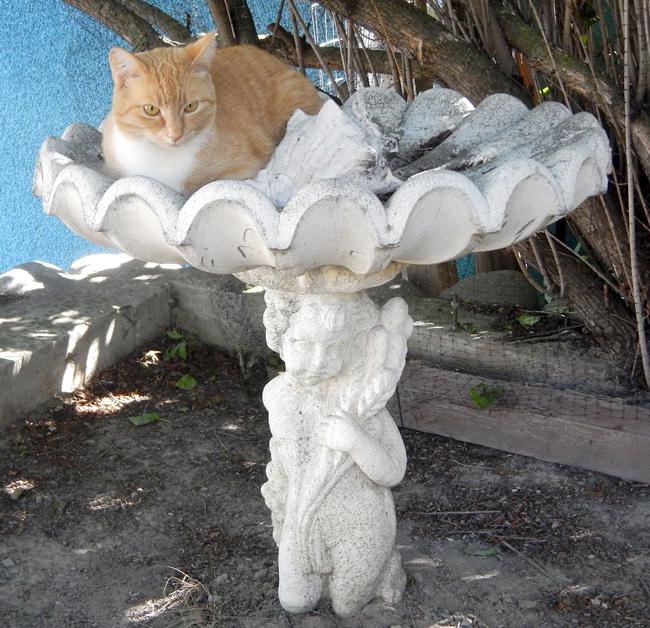 Although this birdbath hasn't been used in years, Lucy the cat got set up in case some unsuspecting robin suddenly decided to get cleaned up. Posted in Birds, Cats on August 27, 2014 by Michele Young. 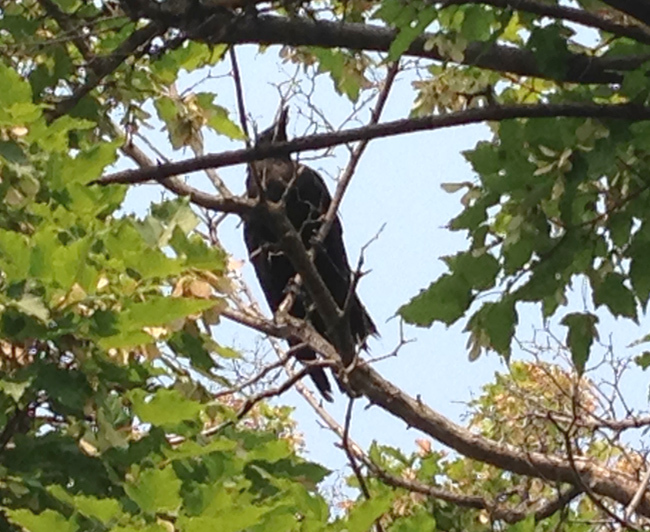 This crow has survived for more than a month in Wendy Ross's Kamloops neighbourhood despite having an injured wing and not being able to fly. It climbs up this tree in her front yard by hopping up from the ground-level branches. Ross is concerned about how it will make it through the coming winter. Posted in Birds, Heroes, Rescue, Wildlife. Tags: Birds, crows, injured animals, rescue, wildlife on August 13, 2014 by Michele Young. Home Depot or Nest Depot? 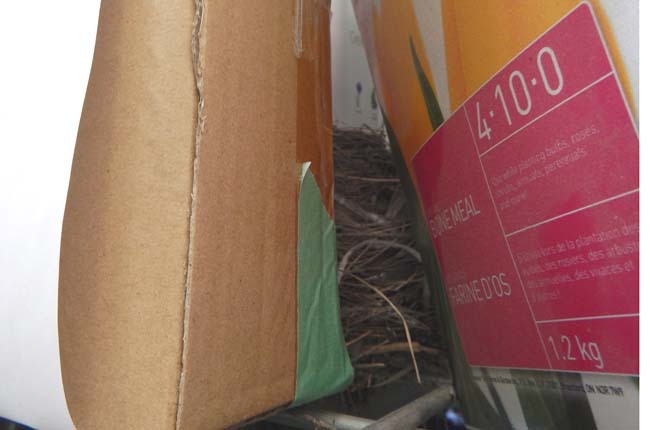 Sitting innocuously on a Home Depot garden entree shelf among boxes of bone meal, this nest of baby birds was labelled by staff to keep people at a respectful distance. A nest-in-a-box at Home Depot's garden centre. I don't know if anyone was home, but didn't want to disturb the box in case they were. Posted in Birds, Heroes. 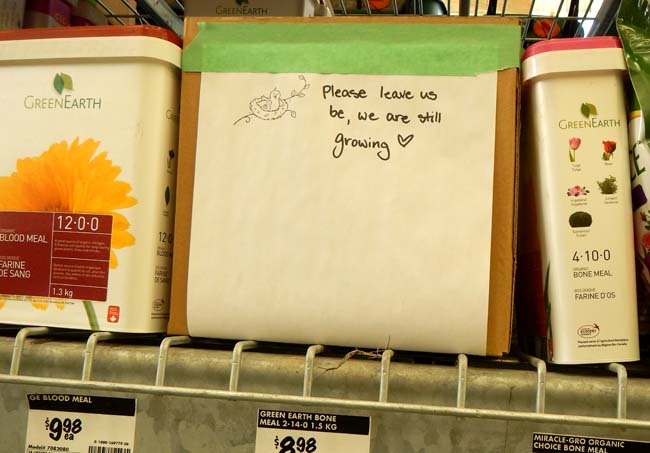 Tags: Birds, nest, rescue, store on July 30, 2014 by Michele Young. 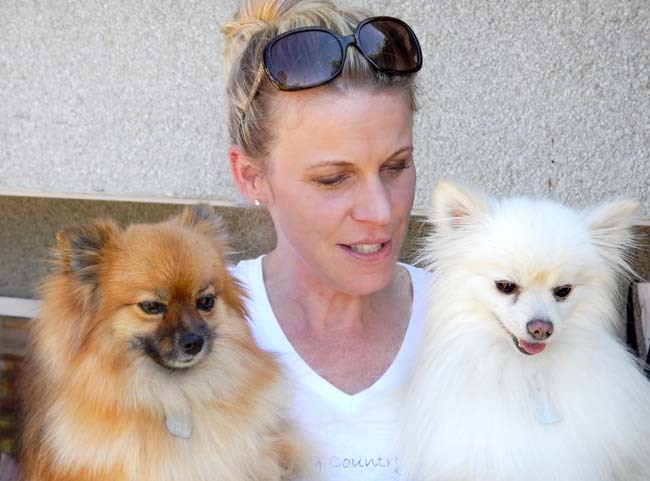 Pommy Country Rescue president Dori McRae is joined by Paris, left, and Bo, right, who are sister and brother Pomeranians looking for a permanent home together. Posted in Dogs, Fostering, Heroes, Rescue. Tags: Dogs, Pomeranians, rescue on July 28, 2014 by Michele Young. 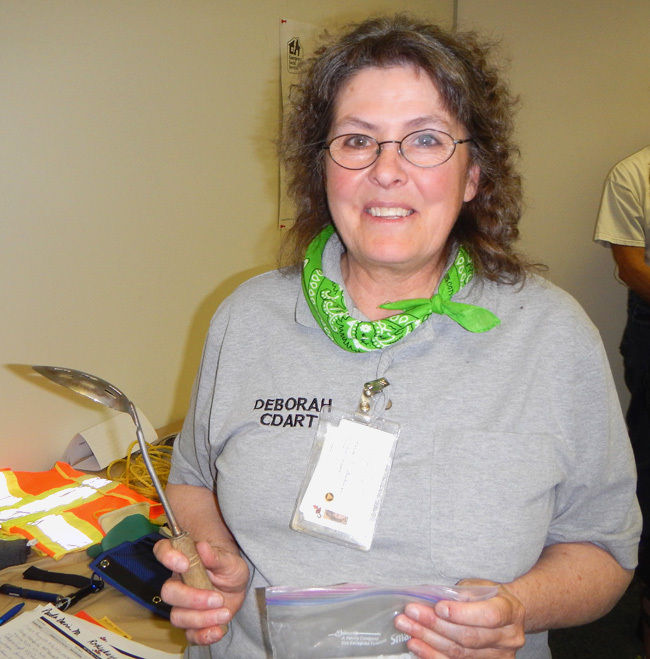 Deborah Silk from the Canadian Disaster Animal Response Team got a group of 25 Kamloops volunteers started with their training Sunday. Note: Full disclosure, I was among the 25 who signed up for the CDART training. I believe I am now a volunteer. Imagine going to a property that’s in the line of a fast-moving wildfire. You have little time to get a family’s dogs loaded up and moved to a safe location.And when you arrive, you realize: this is a puppy mill. Posted in Heroes, Rescue. Tags: Animals, emergency, evacuation, rescue, volunteers on June 23, 2014 by Michele Young. 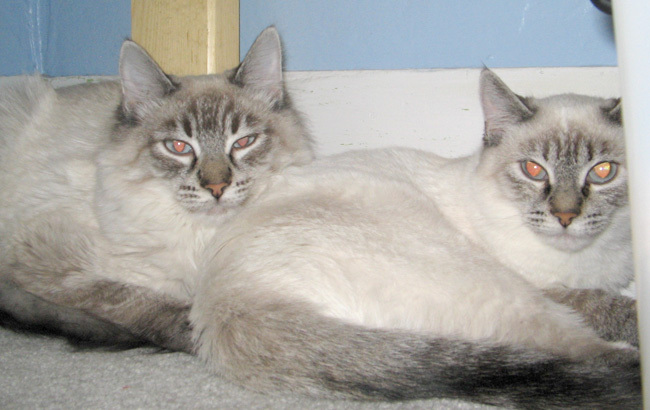 Taffy and Tuffy rest in a safe spot several months after being adopted. The semi-feral duo were found on the streets of Sahali, getting by eating bugs and whatever else they could scrounge. I always root for the underdog. Whether it’s a sports team that has scraped its way into the finals against the odds or the unheard-of singer who can’t afford a glitzy outfit or singing lessons, my heart goes to those who look like they’re going to lose. I’ll walk into an animal shelter and be drawn to the mangy-looking mutt cowering in the corner or the anti-social cat hissing in the back of the cage. Posted in Cats, Ferals. Tags: cats, humane society, kamloops, semi-feral on May 13, 2014 by Michele Young. 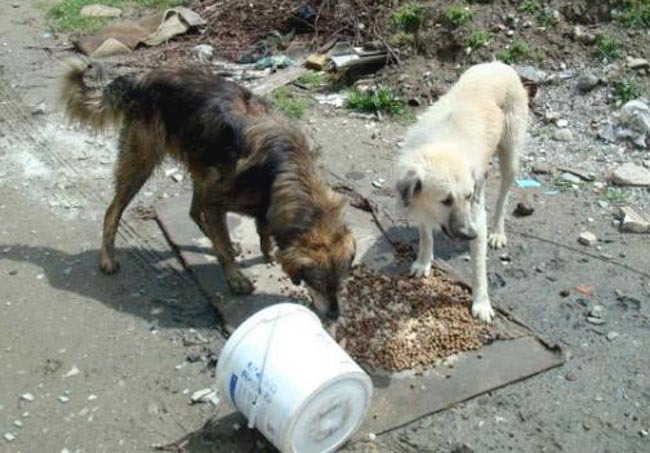 Two street dogs from Turkey find a feeding station. New legislation is aimed at preventing them from being harmed. Animal rights groups recently applauded Turkey for its recent amendment to its Animal Welfare Act that makes it a crime punishable by jail to deliberately harm an animal. The amendment, proposed by the Istanbul Bar Association’s Animal Rights Commission, also jacked up the rates of fines for animal abuse, which is how Turkey has penalized offenders in the past. Posted in Ferals, Justice. Tags: animal cruelty, animal-rights, laws, turkey on May 12, 2014 by Michele Young.